I wrote last week about a “Forbes Style File” piece that offered fashion tips for women presenting at and attending conferences. The topic has generated more comments and emails than anything I’ve written about in the last year, which in itself is an interesting commentary. Although to be fair, it’s a pretty slow time of the year for healthcare IT news. I asked for readers who were attending the mHealth Summit to send their thoughts and observations. Cindy Wright, president of Thomas Wright Partners, offers her own take on the event. I want to thank Dr. Jayne for adding a little additional fun to the mHealth Summit by sharing Forbes’ fashion advice column, written specifically for the mHealth Summit. It made me wonder why in the world Forbes is giving advice on how to build a wardrobe. Just for women, not men? And why this particular conference? I attended last year and did not see any atrocities that might have provoked such a story, but found myself on high alert for any over the top offensive dress as I attended a number of really informative sessions and presentations. All presenters were very professional, and yes, dressed appropriately. Darn it. However, being in the business of marketing and communications — which includes public relations — I concern myself with brands and images. Fortunately, I work with adults who mostly have good common sense and know how to dress themselves and even know where to go for help when in doubt of appropriateness. I am not so much concerned with choice of kitten heels or flats, but how you and your company might best reflect your brand. Being the good marketing professional and huntress that I am, I spent some quality time in the exhibit hall visiting with business owners and hard-working entrepreneurs. Among the large hall of exhibitors, I did find a number of really creative dressers who stood out among the crowd. They were great representatives of their brand. Fun and engaging. Confident in their lively attire. Most importantly, they drew me to them and were engaging. So important, especially if you are new to the arena and maybe even a startup. Oh yeah, and these fashionistas did not follow the rules brought to you by the good people at Forbes. 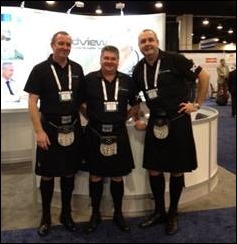 Men in Kilts traveled "across the pond" from Nugensis to share their "views" that improve patient care. The clan of four offered Scotch whisky and fun demos for takers. Dapper European Milan Steskal, proud founder and COO of Mentegram, punches up his gray pinstripe suit with a blast of orange, picking up the color palette in company brand. His app helps keep mental health patients connected with professionals and support team and so much more. Mother and daughter team Glenda and Brittany Gerald, co-founders of MobiDox Health Technologies, not only engage patients in disease management and drug safety, but also engage attendees having fun with coordinated outfits that reflect their business offerings. Where do you find a dress that looks like a keyboard or pharmaceuticals? Not just anyone can pull this off and yet Brittany does while mom plays it cool Chanel style. Thanks again to Cindy for sharing her thoughts. 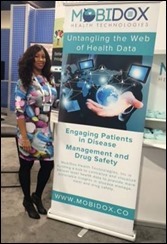 I hope to spend some time with her stalking the halls at HIMSS. It will be interesting to get a professional opinion on what hits the runway (ahem, trade show floor) in Chicago. From Met My Match: “So clearly the issue here is inappropriate dress.” Thanks for steering us back to a piece on the larger issue, which is that women speakers are “still few and far between” at conferences. The piece highlights a Rock Health exploration of the gender gap in speaker counts. With regard to the trainer in jeans and a t-shirt, I think that has a lot more to do with organizational culture than it does with a true power divide. One of the vendors we work with has a very casual culture, which is reflected in its employees’ attire even when they go out to client sites. That’s been a problem for some of our offices and we have had to include a “dress code” request whenever staff comes on site. 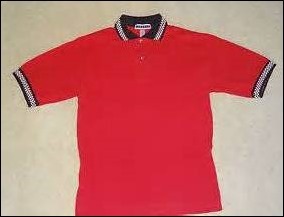 We don’t need them in suits, but a collared polo-type shirt is the minimum of our brand of business casual. When we conducted our ambulatory rollout a decade ago, we were worried about members of the team having too much personal variation in dress and also wanted our staff to be easily recognizable when out in the practices. We bought each implementation team member polo shirts with our project logo on them, to be worn with the brown, black, or blue pants of their choice (no jeans). Although not cheap, it was money well spent as we didn’t have to deal with any dress code issues on the team. The biggest problem we had was being made fun of by our trainees, because it turned out that the particular shirts we picked out were also chosen by a local auto parts store. Even looking at similar organizations, the dress code for similar job roles varies dramatically. While we get away with polos and khakis here, implementers at large medical group I visited in Texas wear dresses and heels every day (they are all women). While that may seem unusual to some, in their corporate culture if they showed up in anything less formal than that brand of business dress, they might lose respect. Who knows what would happen if they tried to show up in scrubs, which is what implementers at our hospital wear? They have a different color than any of the other staff members (who are categorized by color – nurses navy, techs blue, doctors green, etc.). They also wear safety green vests and look like a roadside hazard crew, but they’re definitely easy to find. Looking at our corporate environment, I think the president of our medical group is perceived as too casual. He often wears open-collared shirts when most of our male physicians wear shirt and tie, if not a jacket also. He’s also not a physician, so it’s hard to tell whether dressing up a bit more would help him be more respected. Most of the women in our corporate environment wear skirt suits or dresses. I personally prefer pants, and on one rare occasion when I did wear a dress, one of my analysts announced to the team that indeed Dr. J did actually have legs. The old adage about dressing for the job you want rather than the job you have is still out there, and when I see people that are too informally dressed for the situation, it always crosses my mind. Thinking too much about wardrobe can sometimes backfire. 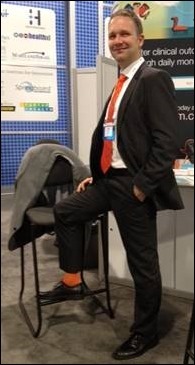 I attended a vendor user group last year and they had decided to put the staff in more casual attire to try to appear more accessible to their clients. It was a calculated move and I felt bad for them when I overheard clients mentioning that they didn’t like it since most of the clients were wearing suits. I’m not sure the power dynamic worked in the right direction. Instead of feeling more powerful, some of the clients felt anxious or annoyed. We’ve all heard that “clothes make the (wo)man” and one of my favorite Broadway tunes (“My Strongest Suit” from “Aida”) is a great play on that. The number occurs at a point in the story when Princess Amneris realizes that she’s been groomed to focus her efforts on appearance when she has the skills to do more for the people around her. As the year winds down and people go into a more thoughtful and potentially resolution-making state of mind, I challenge everyone to think about how appearance and dress influence our thoughts. What can we do to focus more on material, meaning, and message? And where can I find that pill-print dress? Email me.